If a person’s home is their castle, then home security is the moat, drawbridge, and knight standing ready to defend it. While everyone knows it’s necessary to install home security, what exactly that entails is a lot more nebulous. To help, here are 10 ways to secure your home. Homeowners serious about securing their homes should install several layers of protection. While door locks and an indoor alarm are important, you want to deter burglars before they even get to your front step. Here are five ways to secure the perimeter of your house. Clear Shrubbery: High, dense foliage can act as a spotlight to burglars looking for homes to enter unseen by the neighbors or those passing in the street. Ensure that you keep shrubs and plantings well below window levels. The one exception is to plant prickly bushes under the first floor windows, but keep those well trimmed as well, or they too could be used to hide an intruder. Use Lighting: Adequate lighting, like motion sensor and flood lighting can provide strong security against a thief looking for a house to break into. It’s also possible to find “smart” lighting choices that you can control remotely through apps on your phone or tablet. Post a Camera: Another deterrent for many are security cameras. When purchasing, look for cameras that can sense and follow movement, the ones that connect to technology that allows you to watch what’s going on in real time. These give you the ability to call the police immediately if there’s a problem and provide you with peace of mind if the noise outside is merely a raccoon. Security cameras also make it easier to apprehend and prosecute criminals. Keep Belongings Out of Sight: Stow away items neatly and out of sight. Items left out on the porch or lawn, or items inside an open garage door can attract thieves. Bicycles, cars, grills, tools, or top-dollar lawn equipment are all targets that draw attention. Be Good Neighbors: Get to know your neighbors so you can all keep an eye out for each other’s homes and property. If your neighbors know you and your family, they can be aware of any unusual traffic around your home. Tell the neighbors when you will be gone for an extended period of time, like on vacation or a work assignment and have them keep an eye on the property for you. Keep in mind that Först Consulting Group offers estate management services. We will come to your home on a regular basis to check for intruders and storm damage (we can schedule repairs on your behalf as well), and maintain your home with snow shoveling or lawn mowing (by season), replacing security light bulbs, picking up mail and packages, and much more. In addition to securing the outer perimeter of your home, it is crucial that you install a number of immediate safety measures by the entrances. Lock Up: Whenever you move into a new place, switch out all the exterior locks. You never know how many copies of the key or code the old owner gave out. Additionally, make sure window locks are quality made; many window locks are made of flimsy materials, making them more susceptible to break-ins. Don’t Hide Your Key: It’s no secret where you’ve hidden your keys. Everyone knows to look under the doormat, in the mailbox or beneath the garden gnome. If you need to keep a spare outside the house, give it to a neighbor for safekeeping. Install a Smart Doorbell: Smart doorbells, like Ring, allow you to see who is at the door in real time. This alone keeps some potential robbers away as they don’t want to be seen by anyone in any medium. Additionally, if someone rings while you’re away, you can watch to make sure they leave; if they don’t, you can call the police immediately, possibly catching the thief before they get away. Footage captured by Ring technology can aid police in apprehending suspects. Cover Up: Place privacy curtains on your garage, basement and home windows, and in any other place that allows people to see in, especially in rooms that contain valuables. Sheer curtains add a level of security during the daytime hours while still allowing light into the home. At night, cover windows with curtains or blinds as it is especially easy to see into a home when it is lit from within. Advertise Your Home Security: Post security notices on your doors, windows and property. Knowing that your house has a security system is often enough to send potential burglars on their way. Even if you don’t have a security system, it is still worth posting that you have one on your window or near your front door because the possibility makes your house less attractive to someone who just wants to make a quick grab. Don’t advertise the exact model or brand of security however, the potential intruder may know how to disable that particular system. 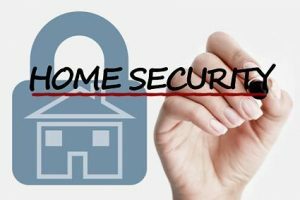 In addition to these and other measures you may consider when securing your home, look into smart home features that allow you to control the different lights, locks, cameras, and alarms you’ve installed. This way, you can protect your home from anywhere in the world. When you are constructing a new home, or need advice on adding smart or security features to your existing home, rely on Först Consulting Group. As construction consultants and construction experts serving Northern Virginia and Washington, D.C., we can help you design secure features or select the best ways to secure your home. And don’t forget about our estate management services for when you need to be away from home. Don’t wait until after your home has been broken into to consider ways to secure your home, Contact Först Consulting Group today. 6 Worst Wiring Mistakes →← What does “LEED Certified” Mean?